A few years ago I went to Fable Kitchen for dinner and I was impressed with their food but it’s not a place I can visit often. I was delighted to hear that they were going to take over the space where Reno’s diner used to be and turn it into a more casual and affordable version of Fable Kitchen but with a diner feel. After trying out a free yoga class nearby, I headed over for dinner. Fable Diner is conveniently located on Main and Broadway. FYI, the yoga class was really low level and felt more like a stretching class. It felt like I spent the whole time waiting for the “real yoga” to happen but it never did… It was my second time trying yoga and needless to say, I don’t think I burned any calories. This entry was posted in American/Burgers, Desserts, Food Reviews and tagged lemon meringue, milkshakes, pancakes, pulled pork sandwich. After hearing and trying the cookie sandwiches from Butter Baked Goods a long time ago, cookie sandwiches have always been on my radar. Good thing the Last Crumb Bakery has them! This was the Chocolate Chip Cookie Sandwich with vanilla frosting. You’re probably looking at this and going, “Where are the chocolate chips?”. There are actually a lot of sizeable chocolate chips in the cookie itself but for some reason not on top? Not sure how they did that but anyway it was a really good cookie! 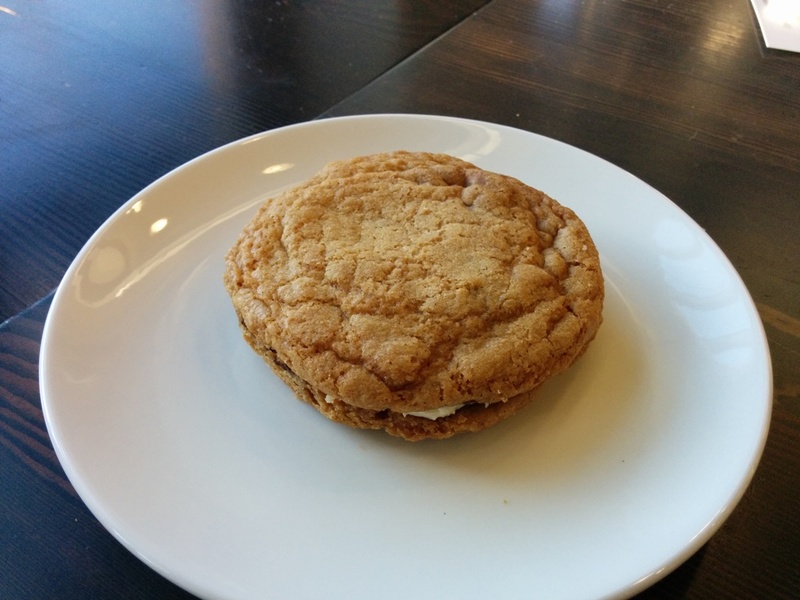 This entry was posted in Cafe/Bakery, Desserts, Food Reviews and tagged chocolate chip cookie, cookie sandwiches, cupcakes, ginger cookie, lemon meringue.